We can not say enough about Hyatt Lost Pines. It is, by far, one of our favorite venues in the Austin area for weddings and events. We love it so much that it’s where we take our own family to stay during our down time. It’s always amazing to me how my husband and I immediately start to relax as soon as we enter the property and start down their long winding entry into the resort. It’s that feeling that you get when you’ve been away from home for a long busy trip and you finally pull into your driveway – you’re just so relieved to be back where you can kick your feet up. Yep, Hyatt Lost Pines is just like that! Whether you’re planning an extravagant 500 guest soiree or a small and intimate wedding for 75, Hyatt Lost Pines in Bastrop, Texas is the place for you! With their lush natural outdoor surroundings and their sophisticated indoor spaces it’s easy to see why so many couples choose them for their weddings and life celebrations. And from the moment you begin working with their catering and banquet department you will know that you’ve made the right choice for your wedding. They are absolute professionals, through and through, and it’s clear that their goal is to make your wedding the best day of your life! It’s this attention to detail and personal service that makes Hyatt Lost Pines one of our favorite places under the Texas sun. Perhaps the best part about Hyatt Lost Pines is that the whole property is perfectly suited to families with children, singles, and older guests alike. There’s really something for everyone at Hyatt Lost Pines. So how’s the food? Outstanding! Their chefs and catering staff is top notch and they are always more than willing to shake things up a bit and prepare new takes on a variety of dishes, to our couples’ liking. And you don’t have to worry about guests with food allergies and sensitivities, because they will happily prepare alternative options specifically for them. We have provided a downloadable floor plan and capacity chart for each site at Hyatt Lost Pines. Please use them as a reference during your planning and decision making process. One of the many perks of hosting your wedding at Hyatt Lost Pines is the variety of Ceremony Locations – both outdoors and inside. From peaceful riverfront and spectacular panoramic views to stunning ballrooms with large chandeliers and super tall ceilings, you will have a hard time selecting your favorite spot. This space is right out the back door of the main entrance to Hyatt Lost Pines. It is a spacious lawn that can seat up to 600 guests, with the hotel as the backdrop. My favorite way to use this space is to drape festoon lighting across the dining tables and the dance floor for a reception space, but it can be used for a ceremony site as well. At the opposite end of the space is a well placed fire pit seating area, so your guests can have smores by the fire if you like. The Riversong Lawn can also be used for a rehearsal dinner. TIP – One of the perks of Riversong Lawn is that there are several hospitality suites that walk directly out to the lawn area, so you can pop in and out to freshen up throughout the night if you book one of these rooms in advance. Probably one of the most unique ceremony spaces, not only atHyatt Lost Pines, but in the entire Austin area. Your ceremony guests will actually be seated on flat undulations on a hillside, overlooking the Colorado River. The altar area is a concrete pad that can be used the way it is or covered with a grassy carpet for a more natural look. The pictures at this site are beautiful! I mean, seriously, who wouldn’t love the river as their ceremony backdrop. Though the Amphitheater would work just fine for small groups, in my opinion the Amphitheater is ideally suited for moderate to large size groups and works particularly well for larger weddings. Because it is on a hillside it’s not particularly suited to those with mobility concerns. However, there is wheelchair access to this space, so don’t feel like the site is out of the question if you only have a few guests that you might be concerned about. Again, because it is on a hillside, it’s a little difficult to walk down the center aisle, because there really isn’t one. Couples typically enter from the right or left side of the altar area or walk down the right or left sides of the hill towards the ceremony site. Due to the gentle movement of the river in the background a sound system with mic should be rented for use by the officiate and the wedding couple. LBJ Pavilion is located at the top of the hill of the Amphitheater and nearest to the pool deck. This is such a neat outdoor space, in that it’s a fully covered pavilion. And it has both a rustic yet sophisticated feeling, with the outdoor stone fireplace as the focal point. It’s an ideal spot if you’re concerned about the possibility of rain on your wedding day. Not only is it already covered, it makes a great back up plan if you are planning on using the Amphitheater as your ceremony site and the weather turns on you. This space can also be used as a rehearsal dinner location. I personally love this sweet little spot. It’s a small ceremony site right next to a small waterfall area on the golf course, far beyond the spa area of the property. It’s also opposite a little pond that I like where you can watch the ducks play. You can orient the ceremony space to back up to either one but I prefer the guests backs to the pond, looking directly at the water fall. That way you get only nature views and no buildings. One of the perks of this space is that it feels like it’s far away from everything, so it’s quiet and peaceful, but it’s actually really close to the main building, so your guests can get to the cocktail area quickly and easily. Hyatt Lost Pines Staff typically take your guests to this ceremony site via golf carts but your guests are more than welcome to walk over, since it’s just a short distance from the building. You should rent the sound system with this space because the waterfall noise, though light, makes it a bit difficult to hear. This site is more suited to small guest counts – under 100 if possible. Otherwise, it can feel cramped. Under 100 feels intimate. This one is a hidden gem. Well, as much as you can hide the 12th hole on a golf course! The reason I call it the hidden gem is that it is not often used as a ceremony site because it so very far from the resort. It’s practically at the top of it all – and that’s what makes it so special! The views from this spot are the most amazing views of the entire property and the surrounding hill country. It’s breathtaking! It requires your guests to be taken up by golf carts, because it’s such a long distance from the resort. It takes a little bit more time to get your guests to this spot, so I recommend having a little beverage station at the site, so guests can mingle while all of the guests arrive for the ceremony. Just like it takes a little bit longer to get guests to this spot, it takes a little bit longer to leave this spot for the cocktail hour as well. This ceremony site is not well suited for those with mobility issues. If you think you may have guests that will have a wheelchair, this is not a site you should consider. The site is more ideally suited to smaller guest counts, so you shouldn’t consider this spot at all if you have over 100ish guests. Though we LOVE this spot, don’t even consider it if you have a large guest count. I would hate for you to fall in love with it and be disappointed. Pecan court is one of my two favorite rehearsal dinner sites on the property! It’s on a large wooden deck that is covered by large oak trees, wrapped in twinkly lights. Adding festoon lighting over the deck really makes Pecan Court a show stopper! While you could certainly have a ceremony here, I seem to gravitate towards this spot for a later evening event due to the beauty of the site at night. And it is super private, almost feeling like it’s hidden away from the rest of the resort. 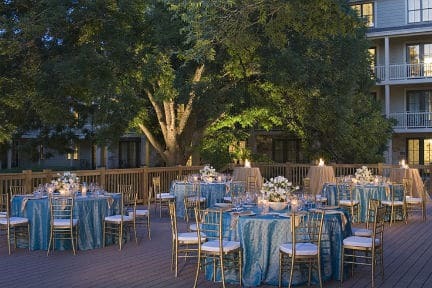 Pecan Court (and Pecan Terrace) are situated nearest to Baron’s Ballroom, which makes it a great location for cocktail hours outdoors before your guests make their way inside for the grand reveal of the reception. It also backs up to the Hummingbird Garden, giving this space a very natural yet elegant feel. UPDATE!! Hyatt Lost Pines has just finished a remodel of Pecan Terrace and it is now a Gorgeous (yes, with a capital G!) ceremony site as well. It is a secluded spot covered with old pines and surrounded by lush landscaping, and backs up to the Hummingbird Garden. It seems most suited to small to upper medium sized guest counts (maybe up to 125 guests). Then when the ceremony is over you can waltz right up the steps to the Pecan Court for the cocktail hour. The driving range is a beautiful lush spot for a ceremony, completely surrounded by forest. This site feels like the most secluded spot at Hyatt Lost Pines, and is located nearest Wolfdancer Pro Shop. A quick ride in a golf cart will get your guests over to the site. You should know that all of the typical driving range accessories are removed to make way for the ceremony chairs in advance. Tip! Since it takes just a little bit more time to get your guests to this spot, I would recommend having a little beverage station of tea and water here, so guests can mingle while all of your guests arrive for the ceremony. This is my other favorite rehearsal dinner site at Hyatt Lost Pines because this is the location where you can bring out food trailers! And guests LOVE food trailers because they’re so fun and interactive. Plantation Lawn is set amongst a number of old oak trees and the space is perfectly suited to spreading out. This is an area where you could have 75 or even 350 guests and it would feel just right for both group sizes. It is located nearest Scribes Club and Sheller’s Bar on the property. It is not very private. Since it is an area that sees a lot of foot traffic near the pool, you will see a lot of the hotel guests in this area. While Hyatt Lost Pines does a great job blocking off the space for your guests only, you are still near a lot of the action. I actually don’t mind this at all, especially at a rehearsal dinner. And, I love to people watch! In my opinion, this is the last place I would have a ceremony, due to the amount of near by foot traffic. If you would like to make toasts or show a slideshow, you would need to rent some sound and A/V equipment. Often overlooked locations for a bridal luncheons, rehearsal dinners, Sunday brunches, and cocktail receptions are the patios at Hyatt Lost Pines. Set on the second story entrance balcony and at Stories Fine Dining, the patios offer beautiful views with the privacy that you desire. Depending on the one you choose and your chosen seating preference, you can comfortably seat or host cocktails to anywhere from 20 – 50 guests. There are several more, of course, but you will just have to call me for a tour to find out more! We’ll start with the ballroom that our couples seem to like the most first. It’s the Lost Pines Ballroom, and I think it’s a favorite due to the location and the chandeliers. First, the location – salons 1, 2, 3, and 4 are the farthest spaces within the hotel and I think that is gives a bit of an illusion of more privacy, which is why most of our clients love it. Second – the chandeliers in the tall ceilings have these crystal butterflies that hang down and can be lit all around in a variety of colors, so that there is a soft glow throughout the event. It’s really pretty, so I can see why everyone loves them. Because the air walls can be moved in multiple configurations, you can have a wedding with as little as 60 to as much as 1200 guests! Barron’s Ballroom is the space located closest within the hotel and immediately adjacent to Pecan Court. It can accommodate groups from 60 to 540 guests, so it’s a little smaller overall than Lost Pines Ballroom, but is still a great space. I personally love the elegant chandeliers and the neutral walls in this ballroom. Without a doubt, my favorite place on the whole property! I could stay in there for hours if they’d let me – and they do! You actually receive access to Spa Django all day long, at no charge, when you book a spa service. Not in the mood for a manicure, but need some recharge time? No worries. It’s just a $15 daily rate for hotel guests. Here’s a link to their list of spa services. Since they have the spa on site, this is a great place for brides (and their bridesmaids) to get their hair and make up done on the wedding day. Did I mention there was a golf course? Like, a really nice one? Well there is. And it’s been named a Golf Magazine Premier Resort for 4 years in a row! I am the first to admit that I am NOT a golfer, so if you are interested in this beautiful course, please go HERE for more details. We can’t have a conversation about Hyatt Lost Pines without mentioning the pool area. The best place on the property (besides Spa Django) to chill out and relax. They have a 1,000-foot flowing river pool, an adult pool, an active pool, two whirlpools and a private sandy beach and if your guests have their kiddos, they will have a blast at the splash pad, two-story water slide and children’s pool. One of the things about the pool area that I love it that there is an adults only section, where you can get away from the little rugrats, if you like. Yes! You can choose to bring all of the vendors that you would like. Obviously, your catering and bar would be from Hyatt Lost Pines. But you are more than welcome to bring your own photographer, cake baker, florist, and more. While Hyatt Lost Pines does include basic linens, you are also welcome to rent your own linens and rentals as well. What about the other hotel guests? I don’t want strangers seeing or being a part of my wedding. No need to worry! Hyatt Lost Pines takes great care with this. They will post guards surrounding the ceremony and reception sites and not allow anyone in. And believe me, they are really strict about this. I once tried to walk through the back area of where an event was taking place and I thought the guy was going to taser me – and I was with a hotel employee. He wasn’t playing around! Should I block a group of rooms specifically for my guests? Absolutely! When you host your wedding at Hyatt Lost Pines, you will want to stay on site the whole weekend. And so will a lot of your guests. And a great perk about having your wedding there is that your guests can also enjoy special rates on their rooms. How close is Hyatt Lost Pines to the Austin Airport? Very close – it’s only about 20 minutes away! Here is a link to directions and a map to and from Hyatt Lost Pines. We want to host our rehearsal dinner off site. Are there any local options? Yes, there are a few local restaurants that we will help you secure for your rehearsal dinner. There are also multiple on site rehearsal dinner locations, if you choose to stay on site. I want to provide transportation for my guests. Can you help us with that? Yes, we can! If you choose to have your rehearsal dinner (or other activities) off site, we will help you secure appropriate transportation for your guests. Can I get my hair and make up done on site? Yes, Hyatt Lost Pines has Spa Django on the property, where you and your bridesmaids can get your hair and make up done. They do an excellent job and it’s a great time to relax and enjoy some time with your wedding party. Will they come to our room? Unfortunately, Spa Django won’t come to your room for hair and make up. You will need to go to the spa for these services. You can either walk or be taken over on a golf cart. While you won’t be able to hang out in your suite, it does leave your room clean and tidy for pictures. Now when you celebrate your wedding day at Hyatt Regency Lost Pines, you can enjoy free honeymoon nights at any Hyatt Hotels & Resorts location worldwide — from authentic resorts that capture the essence of the destination to exciting city hotels in 45 countries around the globe. Whichever honeymoon destination you choose, you’ll make memories that will last a lifetime, on us. Simply book and hold your wedding at a participating Hyatt hotel by December 31, 2014 and you will earn Hyatt Gold Passport® bonus points redeemable for free nights with no blackout dates at Hyatt Hotels & Resorts worldwide. For more information please contact the hotel for details. Here are some of our most popular blogs about Hyatt Lost Pines. These should give you more details about why this is a great venue to host your wedding or corporate event.